Fresh seafood is one of the healthiest of foods. Delicious and easy to prepare, it should be a significant part of a healthy diet. Seafood shoppers, take comfort that our buyers hand-select only the freshest, highest quality available, and carefully inspect everything we buy. • The only kosher fish service in Rhode Island every Thursday from 8:00am – 2:00pm. • A full line of Duck Trap smoked fish and seafood. • Store-made seafood salads, including lobster, prepared daily. We get daily shipments, often twice per day, and we seek out the best seafood from local waters first. Where else can you purchase shad roe in March, softshell crabs in May or tender, sweet Nantucket Bay scallops in November? We’re “hot” to keep our fish cold, so it’s always displayed on ice. Fresh isn’t just a word to us … it’s what we’re all about. 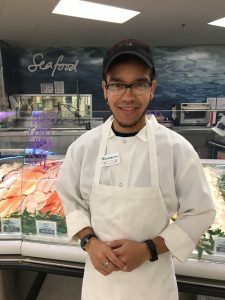 Think of Eastside Marketplace as the place for all your prepared seafood needs. We offer a wide selection of ready to cook items, from stuffed shrimp to salmon pinwheels to fish kabobs. Need an hors d’oeuvre in a hurry? Try our bacon-wrapped sea scallops. In the summer, a seafood salad makes a great sandwich or side dish. And our snail salad? To die for! A Lobster in Every Pot! When you’re in the mood for lobster, we’ve got you covered. We always have plenty of “live ‘n kicking” lobsters on display in our salt water tanks. You can pick it and we’ll cook it for you, and we can even ship it for you. Don’t forget to try our own store made lobster salad. It’s delicious!